We received a phone call from a client relocating to Greenville, SC. 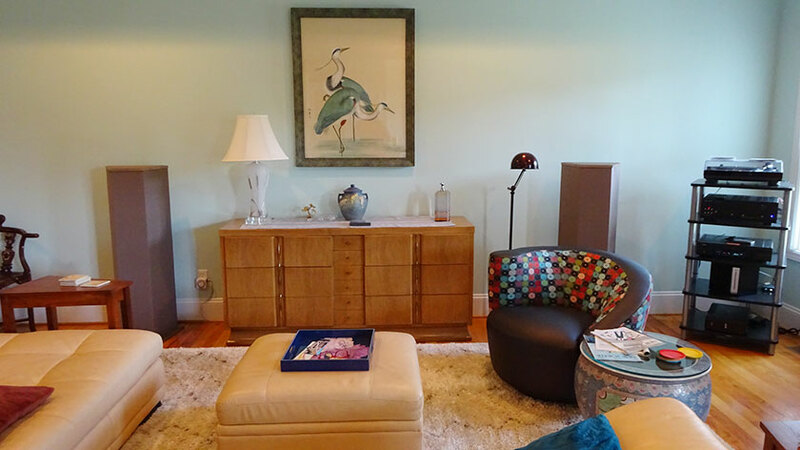 She purchased a home and needed help wiring and installing a pair of Von Schweikert VR-33 speakers in the family room. 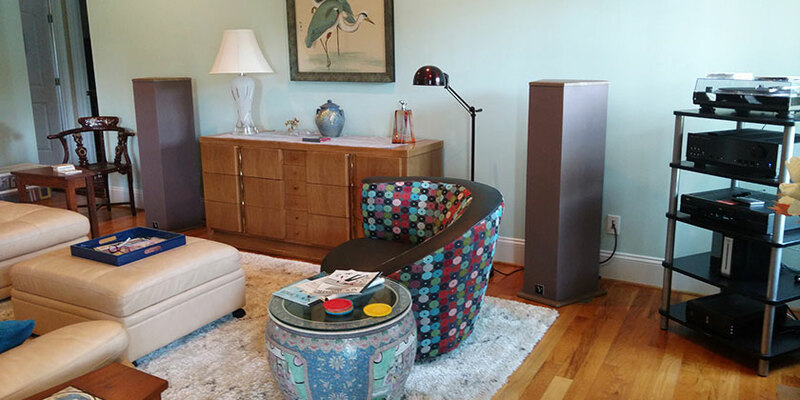 It’s not every day we run across a client with a pair of Von Schweikert VR-33 speakers. We’ve heard good things about Von Schweikert Audio but never had the opportunity to listen to any of the speakers. We were eager to evaluate the performance. The first items we moved into the room were the speakers and audio system. The customer wanted to design and decorate the room around the speakers. First, we needed to temporarily wire and connect the system so she could test the placement of the speakers for a few days. Once happy with the placement of the speakers. She moved furniture into the room according to the speaker placement. If you have some of the best speakers in the world, there’s no need to skimp on speaker wire. Albert Von Schweikert uses Analysis Plus internal wiring for the VR-33 speakers. 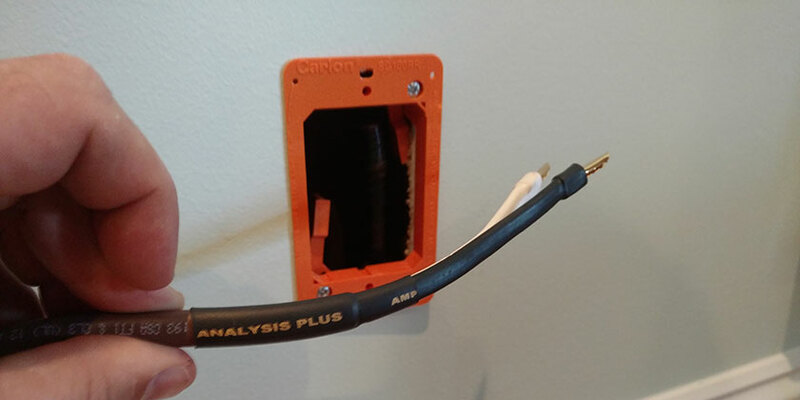 On this project, we selected Analysis Plus Chocolate Oval 12/2 speaker wire to connect our full-range speakers. Chocolate Oval is Analysis Plus top rated in-wall speaker cable. Chocolate Oval 12 gauge speaker cables can be purchased up to 300ft in length. 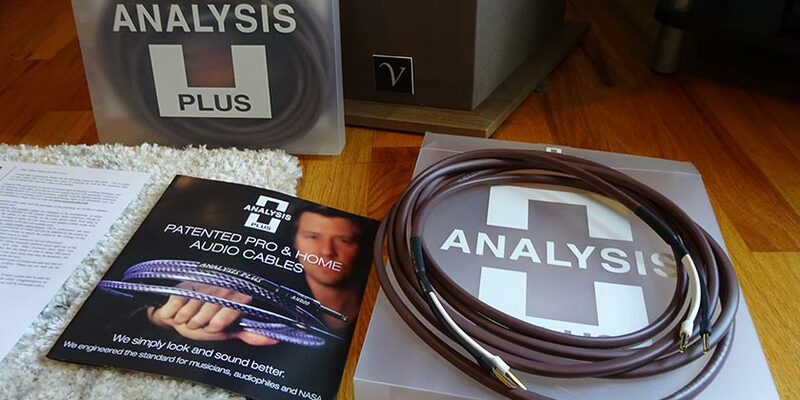 Analysis Plus has a large selection of cables to choose from. If you live in the Greenville, SC area and want some of the best speaker wire on the planet, we are an authorized dealer of Analysis Plus. We keep some speaker cables, interconnects and bulk wire in stock. Give us a call if interested in wiring your home theater or 2 channel listening room with Analysis Plus. We used a 15ft and 30ft Chocolate Oval cable with banana plugs on both ends for this installation. Below is pricing of the cables we used with the VR-33 speakers. We fished both 12/2 wires down the wall under the house and up to the receiver and equipment location. Then we installed a pass-through brush plate to keep the same wire from the receiver to the speaker without an extra termination. Doing this gave it a nice seamless look without exposed wire across the floor. After the wiring was completed, we installed the spike feet and moved the 100 pound VR-33’s in place. Then the new speaker cables were connected. Speakers were placed 10 ft. apart and 8 inches from the wall. The VR-33’s are powered by an Anthem 2 channel receiver that delivers a solid 225 watts of power at 8 ohms to each channel. More details about the audio setup below. Need help wiring/installing your speakers and AV devices? Our client’s favorite music source is the Bluesound Vault. The Bluesound has 1TB of network storage for ripping favorite CDs and downloading music. Streaming is available through popular apps like Pandora, Slacker Radio, TuneIn and many more. Von Schweikert VR-33 loudspeakers are part of the Vortex Acoustics line. 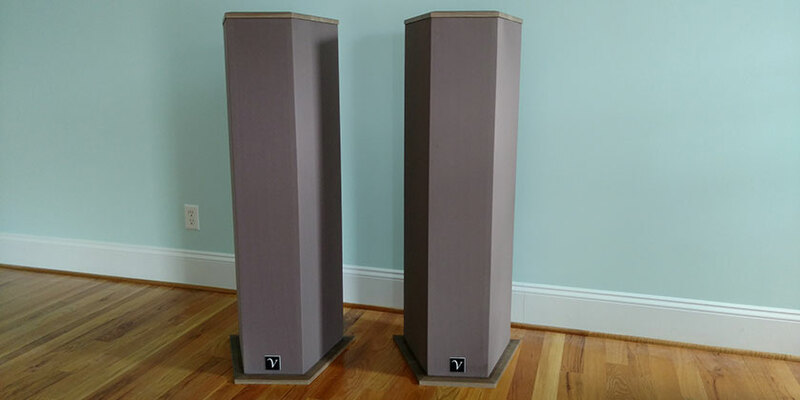 The Vortex Acoustics Line was designed to give clients the best HiFI sound for the money. You’re getting a $15,000 pair of speakers for $3,775.00. You’re probably asking yourself, “How do we get a $15,000 pair of speakers for under $4000.00?” What corners did they cut? All the time and money of the VR-33 speakers went into engineering, carefully selected drivers and tweeters, crossovers, wiring and cabinet design. Everything you want for a full-range speaker that extends down to 25Hz and up to 30kHz with a variance of only +/- 3dB. Von Schweikert Audio speakers are designed and built in the USA using top of the line European parts. The cabinets are built out of MDF (Medium Density Fiberboard) with extensive dampening and 1” bracing. This explains why the speaker weighs slightly over 100 pounds. The speaker cabinet passed my knock test. It seemed to be a well-designed, solid enclosure with no resonance at all. It sounded like knocking on a concrete slab. The VR-33’s feature a 1” Scan-Speak silk dome tweeter for natural and relaxed sound. This tweeter has wide sound dispersion and will play very loud without any distortion. Dual 6” mid bass drivers are located in a sealed enclosure and made of treated paper with composite laminated cones. Boasting a frequency response of 60Hz to 11kHz. These mid-bass drivers sound better than electrostatic and ribbons. The mids and highs are backed up with a 10” high speed subwoofer located in the rear of the cabinet. The bass is adjustable depending on how far the speaker is away from the wall allowing you to tune to your liking. The VR-33’s are designed to work in any room. Using carefully selected top shelf parts. These crossovers are handmade using point to point wiring with no circuit boards. The inductor coils are designed to handle 1000 watts before any kind of distortion. The VR-33 frequency response is 25Hz-30kHz. The subwoofer cuts off at 80Hz and the mid-bass goes all the way up to 6kHz. They designed this speaker so the crossover points are sonically invisible therefore the human ear can’t hear them. Available in many finishes and colors. For more information see the Von Schweikert Audio website. You will certainly hear elements in the music you didn’t know were there. The clarity is absolutely amazing! Produces fast accurate bass notes that other speakers cannot. Sounds great with all genres of music including symphony at any volume. We had the Anthem receiver turned half way up with absolutely no distortion.